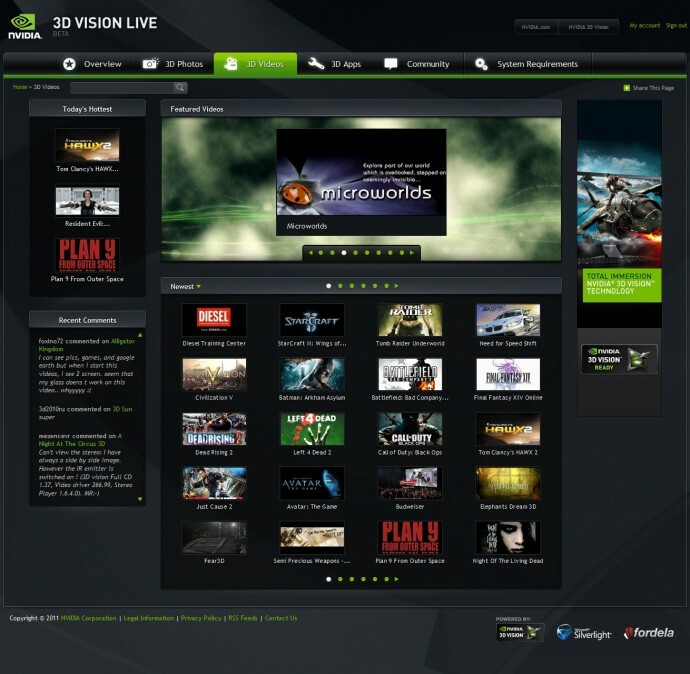 Today Nvidia has made available a 3D plug-in to allow web developers to take advantage of the 3D Vision technology and build Silverlight media players for streaming 3D videos directly from their own websites. The 3D video plug-in from Nvidia is made for the Microsoft Media Platform (MMP) Player Framework v2.5 (F.K.A. Silverlight Media Framework) and offers pretty much the same basic functionality found on the 3DVisionLive.com website for streaming 3D video. The solution is offered for free by Nvidia, along with a brief guide on how to implement it, and of course it user Microsoft Silverlight, requires the use of IIS7 web server and supports IIS Smooth Streaming and Microsoft PlayReady DRM technologies. I’m considering to try it out and maybe add 3D video streaming functionality here at the blog, but lets first see if I’ll have enough resources and time to implement such functionality as it is not a complete out of the box solution and needs some time for a custom solution to be developed. What do you think about this idea, do you want to see 3D video streaming here on the blog? Hopefully this means we could see some 3d movies on netflix soon! On this blog I don’t know… but it will be much easier for anyone to share their videos with family and friends for anyone running a website. Well, you might want to hold off until the 270 drivers get out of beta, but it would be nice to have. If I remember right, Silverlight doesn’t need to be in a browser. You can make Silverlight applications to run on the desktop, too. Like, say, in some new video player program somebody might want to write.